Designed to carry items such as a handgun camera or binocular case securely while backpacking or hiking the HolsterAccessory Platform is also useful for shooting sports enthusiasts. 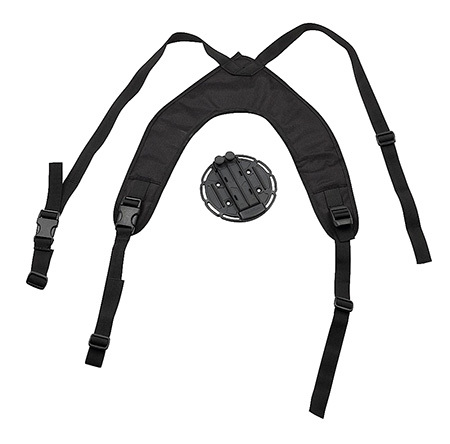 This chestmounted harness is comprised of one size fits most ergonomic aero foam shoulder harness with nylon web straps and quick detach buckles and an injectionmolded multiposition mounting disk with a mounting plate and directmounting fiveposition hole pattern. It is compatible with nylon holsters Blackhawk injectionmolded holsters and Serpa QD adapters.